I haven't read many graphic novels, and I've never read a series as it's being published. 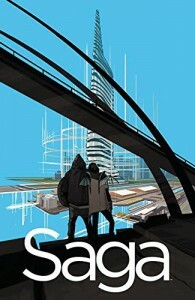 Saga is worth the wait. It's unlike anything I'd typically read (science fiction creatures to the max) and at the same time, it's exactly like the things I love to read (social commentary and adventure). This installment uses a time jump to its full advantage, bouncing us forward to maintain the momentum and excitement of the series. I liked seeing how all the characters had adjusted to their circumstances. And now I'm settling in to wait for the Volume 7.